Last week MacKillop College participated in eSmart Week which is an initiative of the “The Alannah and Madeline Foundation” and together with hundreds of other schools around Australia, we stopped to consider how we can raise awareness of cybersafety and digital literacy, as well as reduce cyberbullying and increase the smart, safe and responsible use of technologies. This year some Year 10 students created electronic posters which were on display around the school and in the Resource Centre. Each day the intranet contained useful reminders for our school community. Our ICCT staff also ran short safety workshops during lunchtime for our students and staff on topics such as; Facebook, Instagram, Snapchat, Twitter & Mobile Phone Safety. Just a reminder that useful information on cybersafety can be accessed via the JBC website. 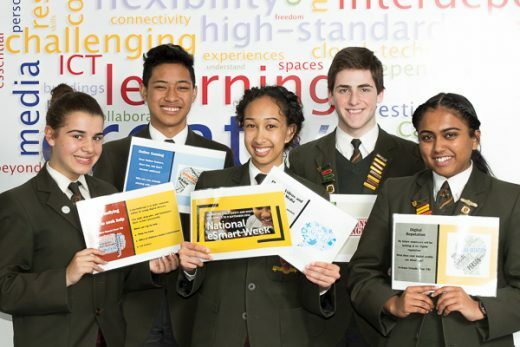 We thank the following Year 10 student leaders for their contributions to eSmart Week: Justine Muscat, Livannia Jong, Josh Arias, Harrison Field and Archana Srinath.